Here you’ll find artwork, episode break-downs, discussions of details you might have missed, easter eggs, and subtle clues left by Vince Gilligan, as well as theories as to which direction the show will go next. We’re only two episodes into the second season, but we can already feel how close Jimmy McGill is to leaping off the ledge. Episode two, “Cobbler,” also shows the seed of discord being sown in his relationship with Kim. Until this point, they have leaned on one another and loved one another. With Jimmy falsifying evidence to knock the police off the trail of a fumbling drug dealer, a line has been crossed. But I want to rewind for a moment to the end of episode one. The painting in Jimmy’s office – a not too terribly subtle image of a figure tumbling backward – is a representation of Jimmy McGill standing on the precipice of moral ambiguity. More on-the-nose, it also definitely pays homage to Jimmy’s con artist days when he was “Slippin’ Jimmy” back in Cicero, taking dives on ice and banking from frivolous liability lawsuits. The image above is a quick digital sketch I made from screen shots from the show; I couldn’t find any clear representations online to link to. The image above isn’t for sale because it’s just a replica I made of somebody else’s artwork. 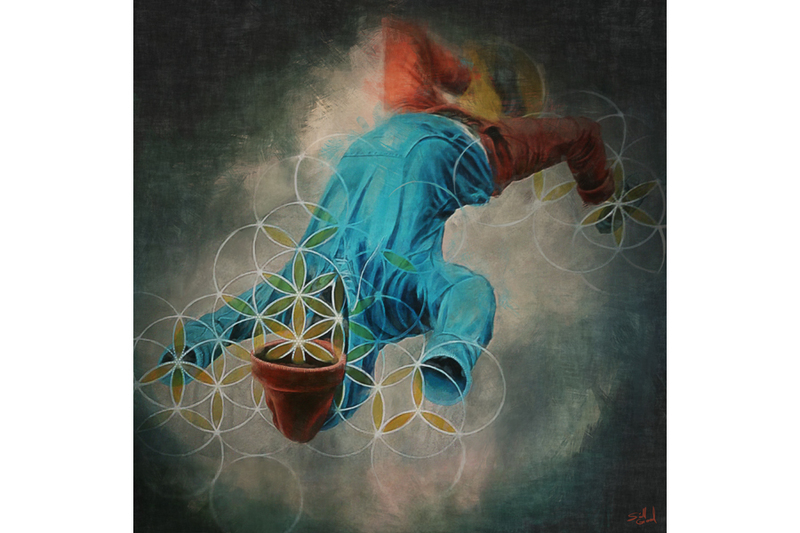 The painting, titled “Geometric Abductions,” is actually made by a twenty-six year old local Santa Fe artist named Miles Toland. He’s currently directing the artist residency program and gallery at Vaayu Vision Collective in Goa, India, which is where you might scope out the impressive mural. This image is perfect for Jimmy McGill’s law office. In the same office is also an image of a vacant boxcar, hinting at the symbolism of standing at a crossroads. Show creator Vince Gilligan is relentlessly detail-oriented. The color palette, costume design, even books on bookshelves in the background – these details have been meticulously thought out, weaving a rich tapestry of character and back-story. Even though most of these details escape us while we’re watching, it’s this intense interest in authenticity that made “Breaking Bad” such a success, and why “Better Call Saul” has captured our imaginations. But he still takes the job offer in Santa Fe, eventually. We’re left with the impression that he’s more curious than passionate about the position, but it’ll serve his interests for the time being. Company car, salary, and his own office – including an almost too ‘on-the-nose’ painting of a man slipping on ice. This week, we see one of our first concrete glimpses into the Saul Goodman we known from “Breaking Bad.” Jimmy spins an intricately detailed fiction and sells it to the police to disrupt an investigation into his client’s extra-curricular drug dealing. How does he do it? Easy as pie – or cobbler. He invents a tale that plays into the jaded worldview police detectives: people are stupid and sick and anything, no matter how ridiculous or depraved, is possible. Jimmy reserves the right to break all the rules, and his lies have migrated from hotel bar and into his profession. This is the first crack in the facade, and temptation is no doubt going to continue chiseling away at his already-flimsy sense of morality.